Satirical News: Toei Ltd. Announces 4th Upcoming Failed Hero Series Called "Tokosou Bakacop"
After the success of the first three Failed Hero entries -- a new 4th entry is coming out. 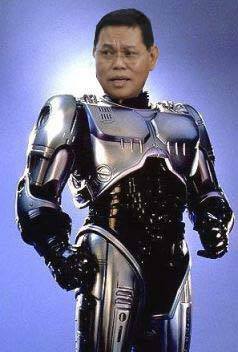 This time, the story will be a Robocop parody called "Bakacop" literally meaning "Idiot Cop". Baka is also synonymous with bobo in Tagalog -- which resulted to the upcoming failed hero series. The story would be a spoof of Robocop. Toei was always known to have a soft spot for Robocop -- whether it would be Jiban, Janperson or the creation of Signalman for Carranger. The main hero will be played by Tomite Naruse -- who once played as Raita Ooshi in Jetman. In this scenario, he was appointed to be the incompetent head of the Japanese Police force. One day, he gets injured in action as a result of his incompetence. He was last seen chasing after some simple bank robbers and he ended up getting seriously injured. Scientists in Japan use their latest technology to revive police officer Alan Pyua into the cyborg "superhero" known as Bakacop. Bakacop will feature the return of some of the Metal Hero alumni. Some of the returnees will be Shun Sugata who will play as gang leader Clarence Bootlicker (a parody of Clarence Boddicker), Atsuko Takahata will play as super evil psychiatrist Juliette Fax Machine (a parody of Juliette Faxxe) and Kazuoki Takahashi as Paul McDoofus. Bakacop gets into hilarious hijinks with half-brained criminals all the while his foil is the mysterious robot Jumperson. The tag line is, "There's a new guy in town -- his name is Bakacop!" Stay tuned for further details!